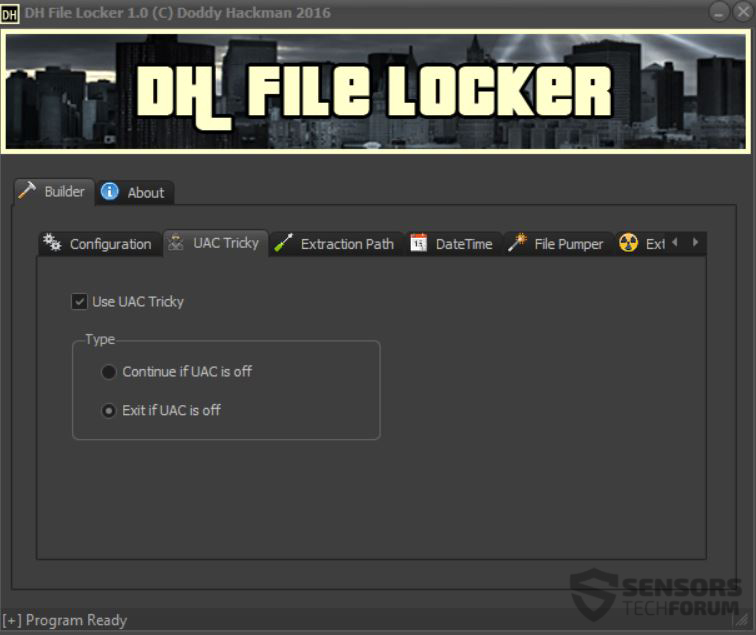 This material is created to show you how DH File Locker Ransomware works, how to remove it, protect yourself from it and restore locked files. 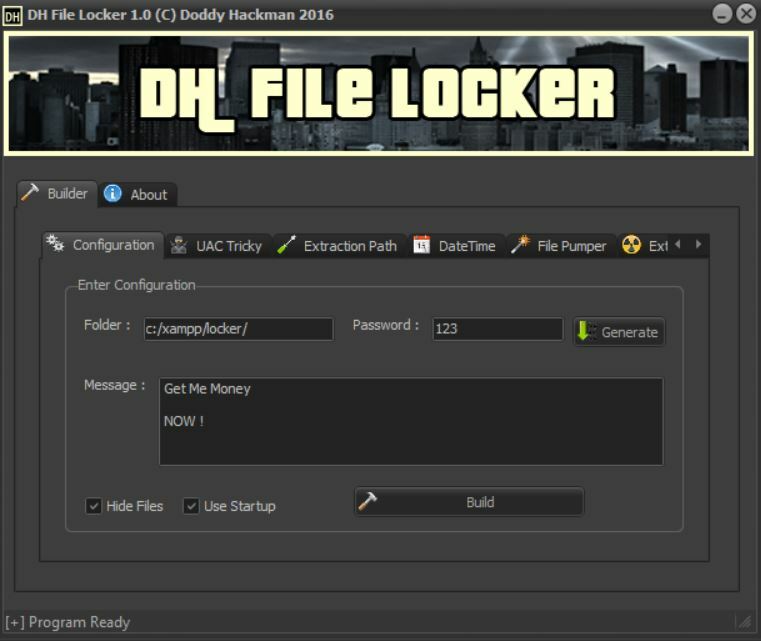 A ransomware builder kit, called DH File Locker with a lots of settings, obfuscation and many features has been released on the deep web and surfaced on multiple web forums. The virus aims to provide full access to even inexperienced cyber-criminals on how to create their own version of this ransomware infection. This is a strong indication that infections by variants of DH File Locker will begin to surface online. We have decided to download the ransomware builder and run it to test it’s capabilities and show what aspects of this virus should you beware of and how to protect yourself from it. Short Description The malware locks victims files adding a custom unlock password. Has avoiding and anti techniques. Symptoms Custom file extension and ransom note are added, depending on what the cyber-criminal configures it to do. User Experience Join our forum to Discuss DH File Locker. The aim of the DH File Locker ransomware is to lock potential victims out of their files and to perform this, the virus also has an extra within it. It generates random passwords for each file that is blocked by it to make decoding of the files significantly more difficult. The main interface of this ransomware is well-designed and has very easy access to all features of this virus, making it user-friendly for any cyber-crook wannabe. The virus comes with a per-embedded message which can be changed for the victim to see. This message is also known as a ransom note and it may contain different ransom instructions for the victim to see, like a payment “request” for different BitCoin amount to an anonymous BTC wallet. As visible from the screenshot below, the configuration also includes a folder in which the infected files are hidden and a unique unlock password which is the only one that can unlock your files. In addition to this, DH File Locker can also be configured to run on system startup and hide the locked files as well. The functions of it can be either switched on or switched off in terms of how it responds when the UAC is off. The virus also has a feature, known as FilePumper, aslo associated with the encryption procedure of the files. Furthemore, DH File Locker has multiple other functions, like Extension Spoofer or a function that allows for a custom file extension to be added to the locked files and in addition to it, the virus can also change their icon with a custom one, to further scare the victim. Since this virus is still out in the wild and may be re-modified and reused in many different versions, we advise you to take multiple measures in order to protect yourself from it. Here are some of the advices which we would definitely recommend you follow. Download anti-malware software which will decrease infection possibility. Learn how to protect yourself from malicious e-mail attachments and web links, by watching the following video. Learn how to safely store your files by visiting our educational material with different methods to backup in a safe manner. What If My PC Has Already Been Infected? In case you were infected by the DH File Locker ransomware, the first thing you should do is to focus on backing up the encrypted files. Then we advise you to follow our removal instructions below. They are carefully designed to help you remove DH File Locker’s malicious files from your computer. In case you do not have the experience in malware removal, experts always recommend using an advanced anti-malware program that will take care of this virus automatically. 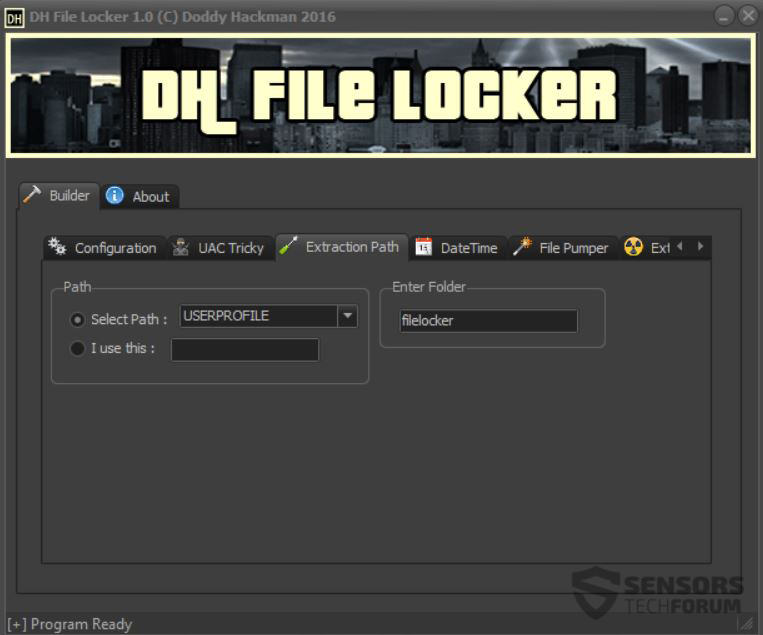 If your files have already be locked by DH File Locker, do not despair, because we have suggested several alternative methods below that can help you recover a big chunk of the files if you are in luck, until malware researchers come up with a decryptor. Threats such as DH File Locker may be persistent. They tend to re-appear if not fully deleted. A malware removal tool like Combo Cleaner will help you to remove malicious programs, saving you the time and the struggle of tracking down numerous malicious files. Threats such as DH File Locker may be persistent on your system. They tend to re-appear if not fully deleted. A malware removal tool like SpyHunter will help you to remove malicious programs, saving you the time and the struggle of tracking down numerous malicious files. Note! Your computer system may be affected by DH File Locker and other threats. SpyHunter is a powerful malware removal tool designed to help users with in-depth system security analysis, detection and removal of threats such as DH File Locker. 1. Install SpyHunter to scan for DH File Locker and remove them. 2. 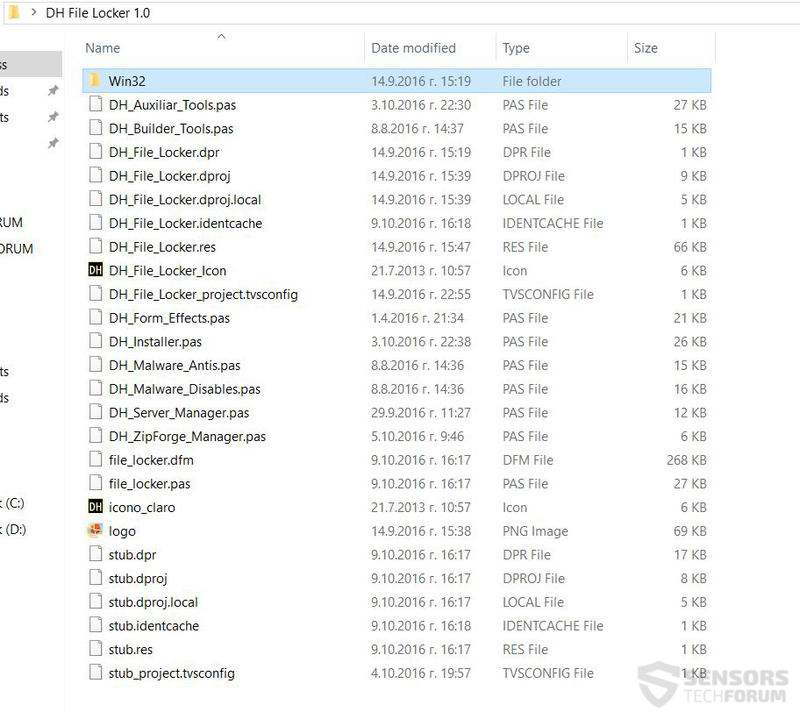 Scan with SpyHunter, Detect and Remove DH File Locker. Ransomware infections and DH File Locker aim to encrypt your files using an encryption algorithm which may be very difficult to decrypt. This is why we have suggested several alternative methods that may help you go around direct decryption and try to restore your files. Bear in mind that these methods may not be 100% effective but may also help you a little or a lot in different situations. Note! Your computer system may be affected by DH File Locker or other threats. Remove DH File Locker by cleaning your Browser and Registry. Fix registry entries created by DH File Locker on your PC. Combo Cleaner is a powerful malware removal tool designed to help users with in-depth system security analysis, detection and removal of threats such as DH File Locker. Step 5: In the Applications menu, look for any suspicious app or an app with a name, similar or identical to DH File Locker. If you find it, right-click on the app and select “Move to Trash”. Step 6: Select Accounts, after which click on the Login Items preference. Your Mac will then show you a list of items that start automatically when you log in. Look for any suspicious apps identical or similar to DH File Locker. Check the app you want to stop from running automatically and then select on the Minus (“–“) icon to hide it. Remove DH File Locker – related extensions from your Mac’s browsers. A pop-up window will appear asking for confirmation to uninstall the extension. Select ‘Uninstall’ again, and the DH File Locker will be removed. When you are facing problems on your Mac as a result of unwanted scripts and programs such as DH File Locker, the recommended way of eliminating the threat is by using an anti-malware program. Combo Cleaner offers advanced security features along with other modules that will improve your Mac’s security and protect it in the future. 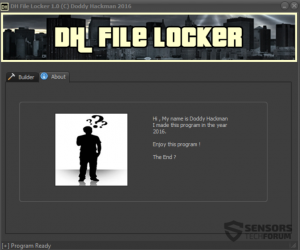 Hey !, I found this information for you: "DH File Locker Ransomware Builder Kit Released (Protection, Review and Removal)". 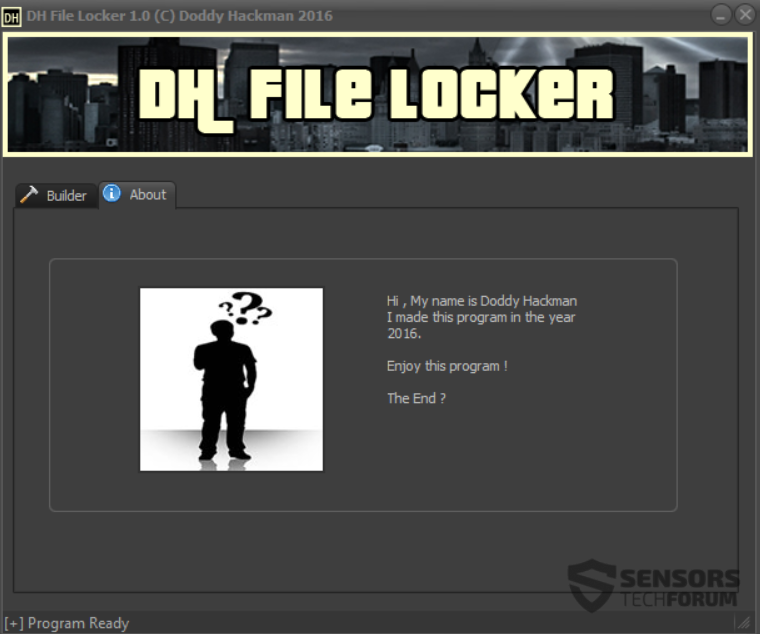 Here is the website link: https://sensorstechforum.com/dh-file-locker-ransomware-builder-kit-released-protection-review-removal/. Thank you.